I'm currently studying for an exam which means I have a binder full of dead trees that is soon going to be covered in little sticky flags marking all the important pages. Which means that I have a boring white binder with a bunch of little yellow rectangles sticking from it. Not exactly the most fun way to study. Aren't those ADOKABLE?! 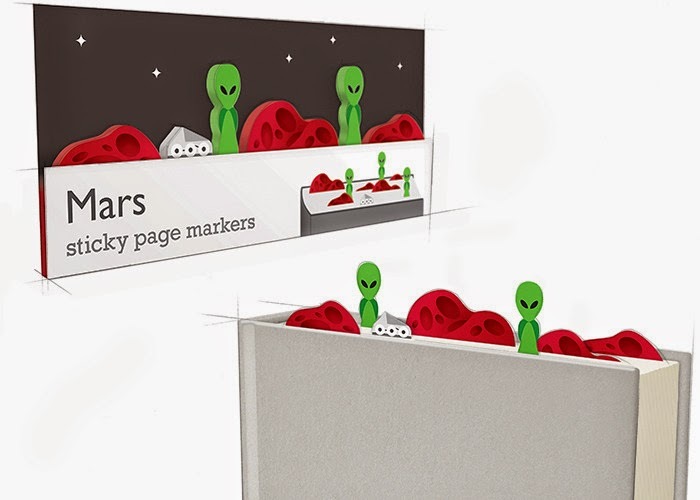 Mars attacks your textbook! Those, my nerds, are little post-it style tabs that you affix to the important pages in your books (remember those things with the pages?). You can vary the position and line them up in various combinations to turn your book into a funky little landscape. and creature themes including the Loch Ness Monster and Tokyo featuring Godzilla. Now, if you're wondering where to get them, you'll need to head over to the Sticky Page Markers KickStarter page. What I love most is that the pledge rates are really reasonable, starting at £8 (yes. this is a UK KickStarter, so International shipping rates will be in play). If you're wondering whether or not these will ever see the light of day, fear not: the project still has 20 days to go and is already more than fully funded.